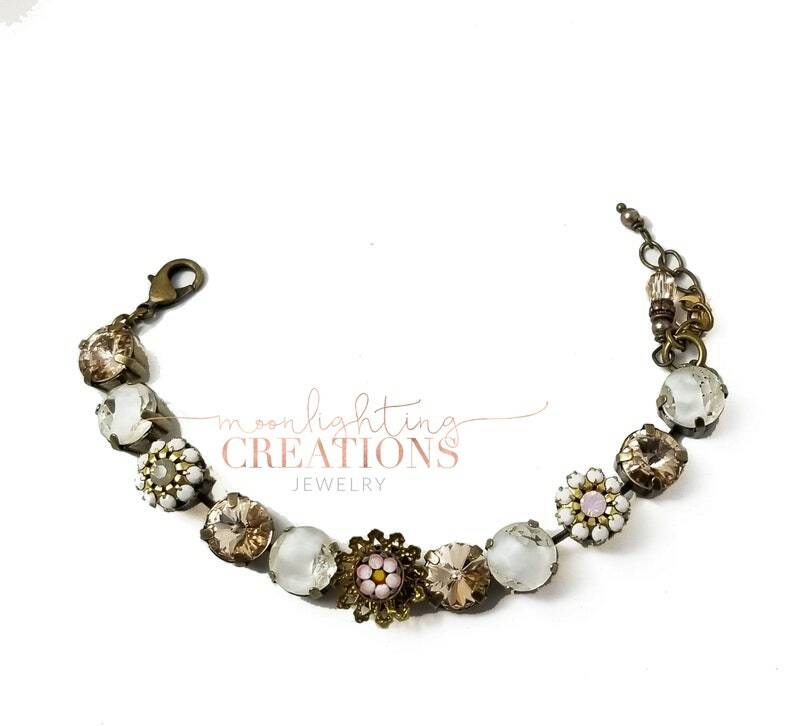 One of a Kind Genuine Swarovski Crystal Chaton bracelet featuring 8 10mm stones with shades of white and champagne colors. Made from Vintage White Givre Rhinestone Dentelles used in High End Costume Jewelry and White Chalk Brass Setting from the 60s. Designed with high quality antique brass settings and findings. Closes with a lobster clasp. The bracelet measures approximately 7 1/2" in length. If you would like a longer length, I would be happy to add extra chain to your custom length. Please use the zoom feature when viewing listing pictures for the best viewing experience. This is a One of a Kind. Will not be duplicated exactly.